One For The Cool Kids! 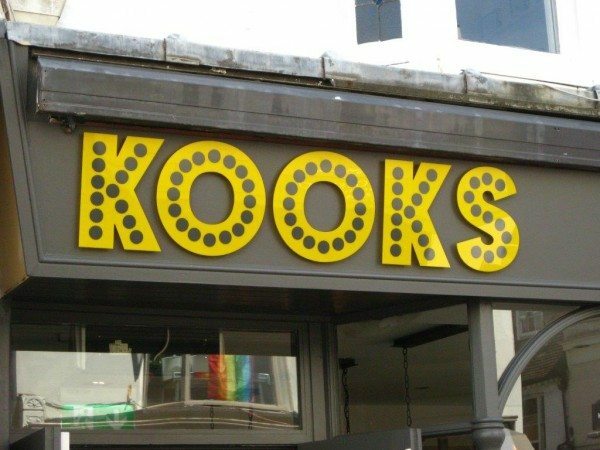 When approaching Kooks on Gardener Street, you can tell that this place has been through a real transformation from the previous cafe that was there. Gone are the big glass cake counter at the front, traditional artwork and décor (and the knitted seagulls in the windows), and in its place is a sleek and cool venue. Think brushed steel bar counter, on trend lighting, wooden walls and vintage album wall art. It works really well, and mix it with the eclectic mix of music playing throughout the evening then this restaurant/bar is definitely one for the younger crowd looking for a laid back dining experience whilst sipping delicious cocktails. 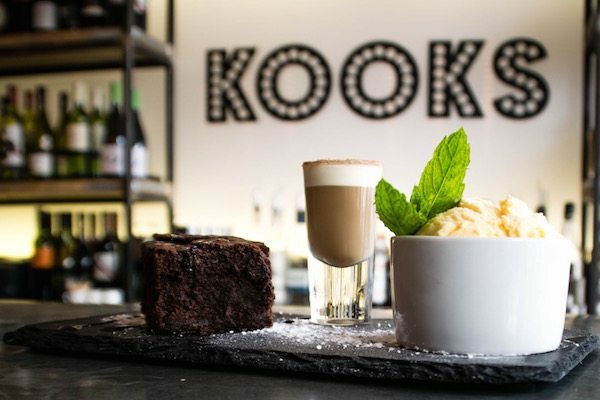 Kooks is not a big place, a few tables opposite the bar as you enter the restaurant and then a small selection of seating at the rear. There were two or three tables taken with diners when we arrived (it was a Wednesday evening), and it didn’t feel empty – there was a nice buzz to the place. We were here to do a burger review, and the burger we had! 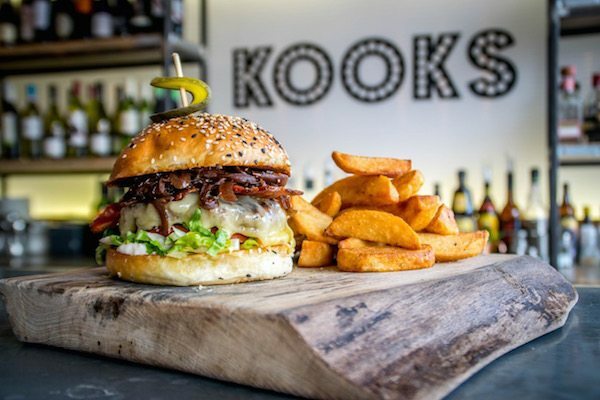 There is just one on the menu (minced steak burger with streaky bacon, cheddar cheese, tomato, lettuce, brioche bun and either twice cooked chips or sweet potato chips, £12.00). Whilst we were waiting for our burger to arrive we sipped our cocktails. Both of us chose to have the Tom Collins cocktail (gin, lemon juice, sugar and soda), £7.50. Now, normally cocktails and served in small glasses or over lots of ice leaving little room for the actual cocktail. Not here! The glasses were big, with the right amount of crushed ice and garnish. Delicious and well worth the treat! When the burgers arrived they looked impressive. Served on large wooden boards it was presented very well together with the chips. The burger itself was stacked and very colourful, with the bacon, burger, cheese, gherkins, tomato and lettuce all vying for attention. They are so tall, that unless you are a giant there really is no way to eat these burgers with your hands. Myself and my dining companions all had to give in and use our knife and forks. Now, if you like your burger to pink (bordering on the blue), then this is the place for you – the meat had literally been seared. It was seasoned well and was beautifully moist. When eaten with the rest of the burger garnishes it was lovely. So often places like to make the bacon in their burgers very crispy, but this was cooked perfectly for me. The cheese had melted as if it was a thick blanket wrapped around the meat. And the baby gherkins were delicious, in no way over-powering and added a real sweetness to the dish. 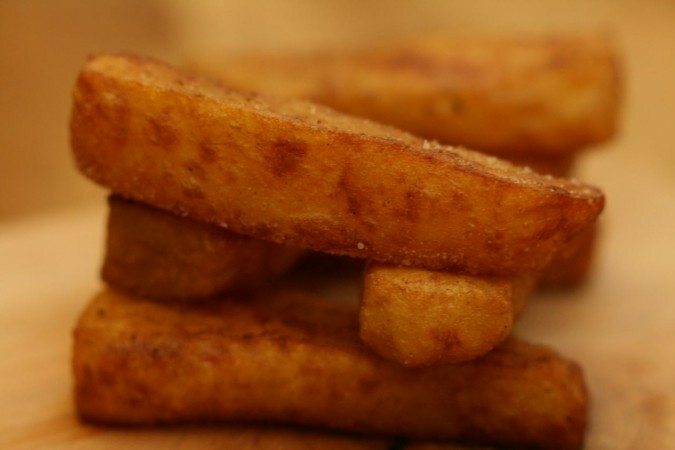 The twice cooked chips were lovely and crisp on the outside and wonderfully fluffy on the inside – as chips should be. And the sweet potato chips were absolutely delicious. The bun itself was maybe a little small for the burger, but again was lovely and for the brioche to be seeded was a nice little twist to a traditional burger bun. Now after these enormous burgers you would think that we wouldn’t have any space left for desserts, but we couldn’t not have something from the delicious selection they had to offer. I opted for the Chocolate brownie, ice cream and a shot of Toblerone cocktail (£6.50), Mum went for the Eton Mess (£5.50), and Dad chose the Pudim de leite (Brazilian crème caramel) (£5.50).We were so pleased that we did. My chocolate brownie was everything that a brownie should be: warm, dark and gooey on the inside. The ice cream was a welcome accompaniment and really lifted the dish. The Toblerone shot (Baileys, Kahlua, Frangelico, cream),is also available as a cocktail, but it was so very rich and so very naughty that a shot was just the right amount for me! Mum’s Eton mess was served in a de-constructed style on a slate and was delicious. There was a good balance of cream and meringue with a generous amount of strawberry’s on top. It was eaten almost as quickly as it arrived! 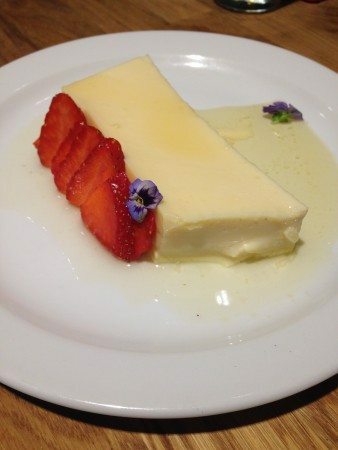 Dad’s dessert was a Brazilian style Crème brulee, think a custard dessert without the burnt caramel sauce. It was incredible and very tasty. If you are wanting something in the form of sweet comfort food then this is definitely the dessert for you! After a quick coffee for Dad and the finishing of our cocktails it was time to go. All in all it was a great evening, with a lovely atmosphere and good food. What more could you ask for. On arrival the burger looked good. Tall and well put together, with all the accompaniments visible. The cheese was lovely and thick and coated the meat like a blanket, the bacon was not too crispy and the gherkins were sweet and delicious. The bun was toasted well top and bottom, and the seeds were a nice twist on the brioche. If I’m being picky it may have been just slightly too small to contain all the burger accompaniments. They cook their burgers pink here which may be off putting to some people. However, the meat itself is well seasoned and juicy. Both the sweet potato chips and the twice cooked chips were delicious and well seasoned. The only condiments on offer were either ketchup or mayonnaise, but then what more could you need!